Body Transformation: Mass Muscle Construction! 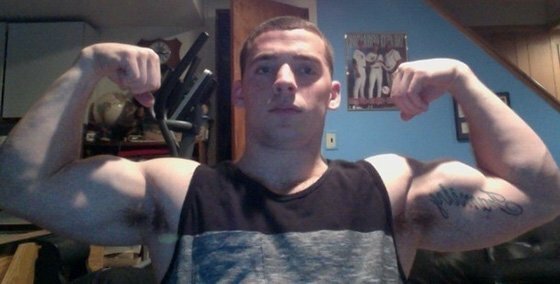 This teen abandoned his scrawny frame and built 47 pounds of muscle in two years. See what it takes to live in a body constructed of massive muscle! When I was young I wasn't in good shape. I was short and slightly overweight compared to other kids. I started playing football at age 6, but never tried weight training until my freshman year of high school. In high school, I continued to play football and joined lacrosse and wrestling. I went to the fitness center at school a few days per week at my football coach's discretion. 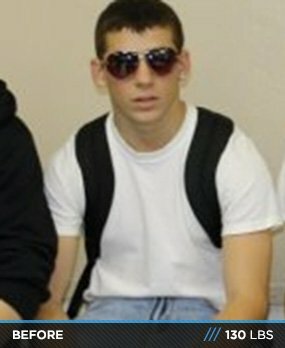 After my freshman year, I lost lots of fat and got skinny from wrestling. I decided to quit wrestling to focus more on football, lacrosse, and my newfound hobby, lifting. This is when I started to lift seriously and quit messing around at the gym. It's hard to play sports when you're short because everyone on the other team picks on you. I wanted to make sure that would never happen to me. It helped me in football because I wasn't afraid to go all out and hit with more power. Being short kept my confidence level down, but the compliments I got when I got bigger made me feel better. After lifting for nearly four years, it feels great to look back at my old scrawny self. One of the best feelings I get is when my friends are inspired to start lifting and transform too. I got a New York Sports Club membership in the summer before my junior year and everything changed. I didn't go to the gym much before because I was young and didn't want to risk getting hurt for sports. When I reached varsity football and lacrosse, I started to seriously work out and take supplements. On nice summer days, I was at the gym instead of out in the sun because I wanted to get bigger. When I got the hang of working out, it became habit. I put the gym into my daily schedule and recorded what days to work out and which days to take off. I saw amazing results and started doing research to learn more about my body. I never thought about giving up because it would make me go back to my regular self. I knew things would change. When I saw my results, I kept working hard and saw better results. It all pays off. I changed up my diet to make sure I got the right amount of protein and complex carbs into my body. I made sure to stay hydrated by drinking only water throughout the day and carried a water bottle with me everywhere. I worked out for at least five days per week. After each workout, I do a dropset to failure. I switch up the workout order every time and start with a different exercise and rep range. When I work arms, I do a bunch of supersets. I love eating. That's the hard part about getting big and lean. I used to eat what I wanted knowing that I was going to the gym later and went twice as hard. I stopped that. Now I eat clean most the time and make sure to eat the right amount of protein. I'm on a strict diet and don't find it hard because I like to eat that way. I always feel good and healthy. Seeing results make me eat even healthier. I will end up studying for my personal training certificate soon. Maybe, when the time comes, I'll enter a competition. Never give up. I always knew I would get in great shape and that day came. I was an athlete growing up, so I knew what it took. You have to push yourself, work hard, and be patient. Getting big doesn't happen overnight. It took me three years to get to where I am now, and I don't regret any of it. 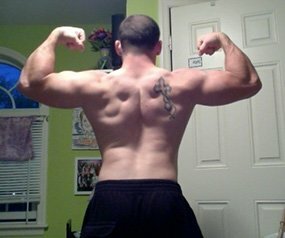 The articles on Bodybuilding.com helped me learn about my body and find important workouts. It also helped me learn about supplements and what they do. I always look for new workouts and exercises on the site.